We like to get away in Nido at least twice a month, even if only for a short weekend away. 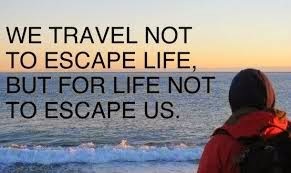 It gives us something to look forward to and acts like a mini-holiday. We keep an eye on the weather forecast but if we made a ‘Go/No Go’ decision based on that, we’d never go anywhere! Besides, we need to give the storage site a couple of days’ notice when we take the van away, so we normally just go for it. In the past 6 weeks we’ve only had one weekend at home and then we weren’t too sure what to do with our time. 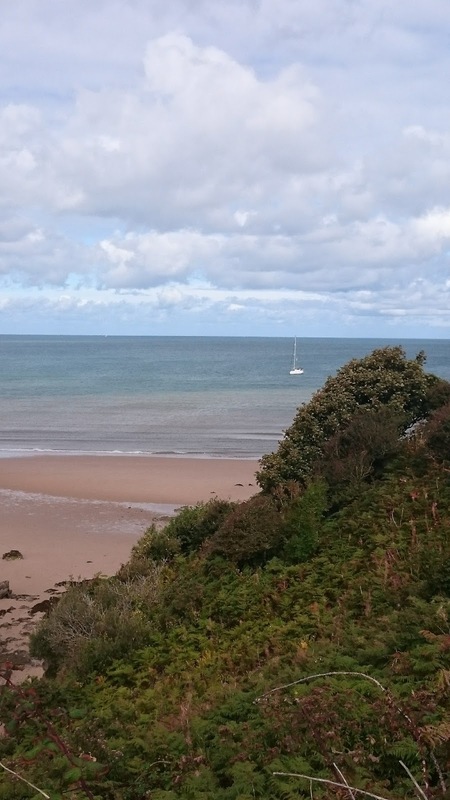 Next weekend we have a list of outside jobs to do, but this weekend we planned a trip to Anglesey, via a visit to a friend in Prestatyn. On our last trip away in Yorkshire, we had a couple of water leaks - one on the sliding door (felt covering overlapping the rubber seal) and one in the bathroom (dodgy tap). Nido was booked into A&E (the name of the company that built him, not a hospital for campervans!) for last Monday to fix both; the former was done but they had to order a new tap, so he went back in on Friday to have the new tap fitted. Cathy managed the A&E visits and brought the van home later in the morning, packing clothes, dry food and filling up with fresh water. We have space to keep Nido across our drive for the odd night, but couldn’t keep him there permanently unless we made some changes to our drive and got rid of a car, not an option right now. I returned from work at about 1730 and, after a quick turnaround and loading up the fridge, we hit the road. 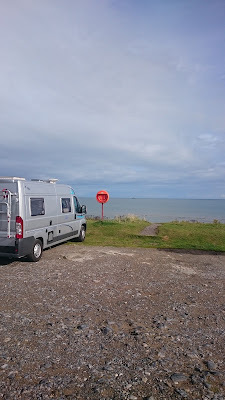 Our first night was going to be spent ‘wild-camping’ at Prestatyn Golf Club. Our friend - Julia - runs the Yew Tree Restaurant at the club, which is open to members of the public. She’s been there a few months but is already getting good reviews for her food. It was a warm evening and the traffic wasn’t too bad, so we made good time and arrived just over an hour later. Coincidentally, Cathy’s sister - Maggie - was spending the weekend with Julia, so it was lovely to see her too. On arrival we called them to find out where best to park - the answer was outside Julia’s flat, which would provide maximum protection from rogue golf balls! Once we’d settled in Julia took us all off in her car for fish and chips, which we ate sat on the concrete wall on Prestatyn beach. It was still warm although a bit windy and we could see a lot of dark cloud building to the west (ie in the direction we were heading tomorrow!) but we didn’t get rained on and Cathy & Maggie enjoyed their barefoot walk on the sands, with the tide out. Back at the golf club, we sat in Nido for a brew and a chat before moving to Julia’s flat; she wanted some help with restoring an iPad to factory settings - it’s very rare I’m asked to help with anything technical and some of my work colleagues would laugh reading this, given my ‘technical dyslexia’!. I also had the chance to have a look around her galley (naval speak for kitchen). It’s quite small for such a large operation but she’s planning to replace some of the equipment soon which will really help her. All of us were feeling weary so it wasn’t a late night and we soon retired to Nido. It was a wet and windy night outside. The sliding door didn’t leak, but we were in quite a protected spot, so we need to test this properly in the wilds - shouldn’t take too long for the opportunity in this country! After breakfast in the van, I filled up fresh water then Julia invited us up for a bacon buttie and a brew - how could we refuse a second breakfast! She was gearing up for what would be a busy day; we had no idea that a wedding party would be arriving at 1800 that evening and had we known we’d have left her early to focus on that. She seemed very calm about it all whereas I would have been in panic mode by then! Still, she seems to be enjoying the challenge and we have no doubt she’ll be successful. Eating our butty, the rain lashed down outside but eventually started to tail off, so we took the opportunity to say our goodbyes to Julia and Maggie and continue our journey to Anglesey. 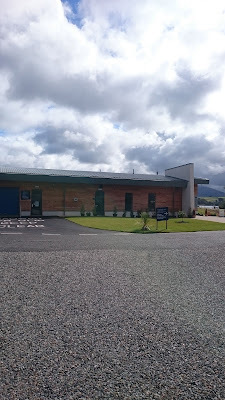 Our first stop on Anglesey was the Halen Mon sea salt centre. They have recently opened a new store and visitor centre and increased their opening days, which meant we could visit on a Saturday. It’s in a lovely spot in the south east of the island, just across the road from the straits. They do tours of the manufacturing process for £6 per adult, but we only wanted to look around the shop. We bought a variety of lovely sea salt; they also sell other related products and it’s well worth a visit. 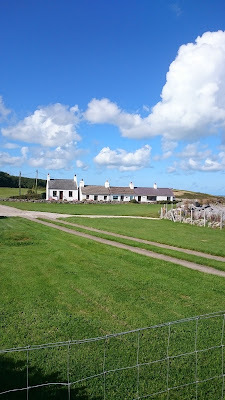 Leaving Halen Mon, we drove through the middle of the island, along some fairly narrow country lanes, but with plenty of passing places, before arriving at Lligwy Bay. 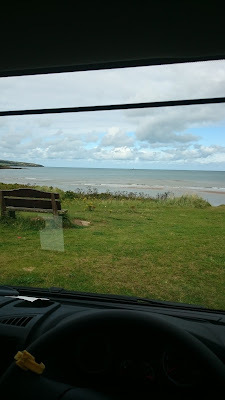 The car park is large and a bit bumpy in places, but there was space overlooking the beach. 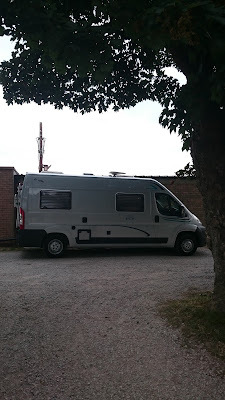 We parked up next to a coachbuilt motorhome; there were about 4 motorhomes already there and looking like they stayed overnight. 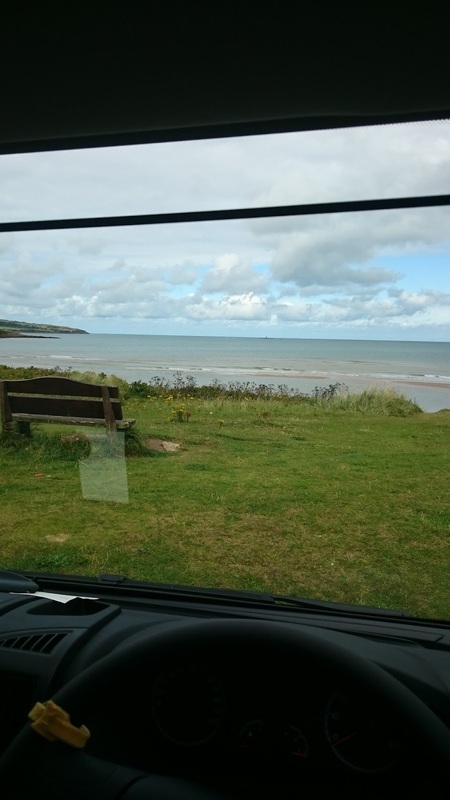 I went into the cafe to pay for our overnight stop - £10 - quite expensive for a basic car park with no facilities but the view is great and, hey, UK isn’t cheap for motorhome stopovers. 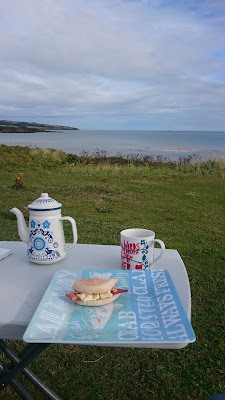 Once settled in we enjoyed the handmade pasties Julia gave us - delicious - with a brew, looking out over the beach and the sea. The tide was out, so we decided to take a walk along the coastal path, heading towards the village of Moelfre. The weather was good and we were soon down to t-shirts and shorts, stopping occasionally to take a look at the rock formations and out to sea, before passing the RNLI lifeboat station and walking into the village. Moelfre is quite a large village, with a small waterfront with a pub, cafe and a restaurant - Ann’s Pantry - which we ate at a few years ago, very good it was too. 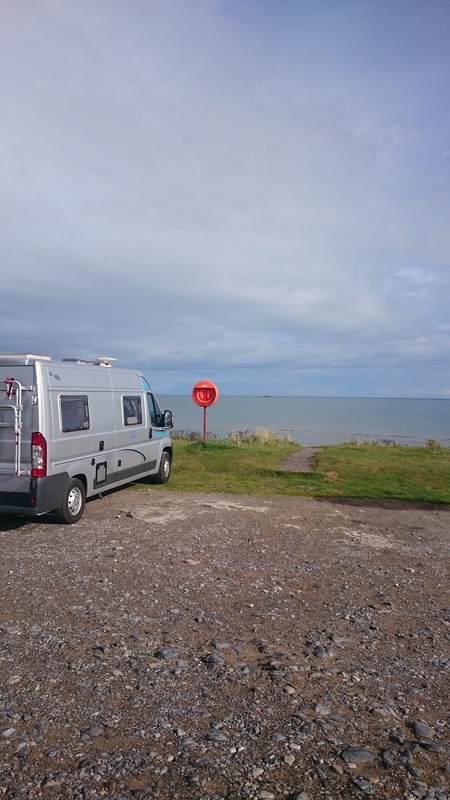 After a loo stop we reversed our route and returned to Lligwy for a brew. 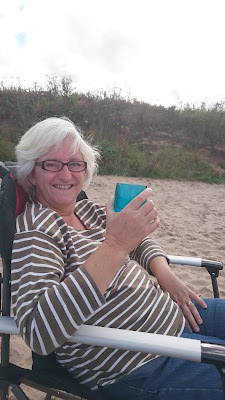 Later in the afternoon we took our seats down to the beach, with a G&T (Cathy) and a beer (me) to enjoy the sunshine. 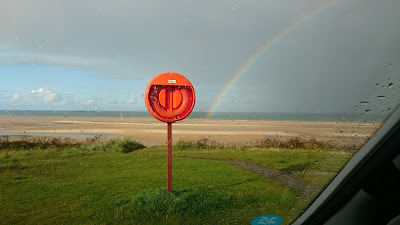 But soon the clouds were building so we returned to the van, making it in time to avoid the heavy rain. But we enjoyed the view, sat in the cab seats overlooking the sea, including some a great rainbow later, which fell on the beach and gradually moved out to sea. Despite the heavy rain the sliding door didn’t leak, so hopefully that’s now fixed. I cooked dinner in the van - lamb chops with a greek salad made by Cathy earlier. We shared a bottle of Portugese Rose and then, perhaps foolishly, opened a bottle of red. Washed up and everything put away, we watched the sunset over the cliffs before heading down to the beach in the dark, with a little light left in the sky, for a walk and a giggle! Then back to the van for some hot chocolate before sleep. We woke to grey skies but it felt quite warm out. I made a brew; Cathy had hers in bed and I stepped out to drink mine looking out over the beach. 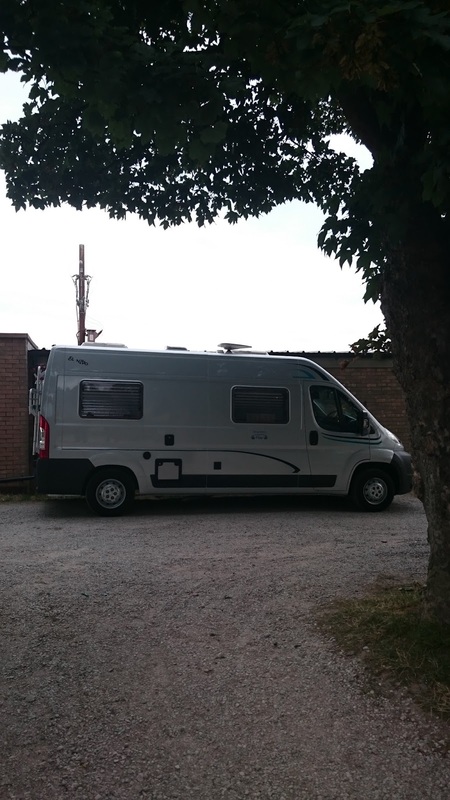 Breakfast was bacon and egg muffins, cooked on the Cadac Safari BBQ outside, and enjoyed sat at a table and chairs on the grass in front of the van. We took a morning walk along the beach, with a paddle in the ebbing tide, as the cloud gradually broke to give us warm (occasionally hot) sunshine, with hardly any breeze. Families were arriving to enjoy the beach time and it felt like mid-summer, not mid-September. We took our chairs down and I later made lunch (more pasties - thanks Julia!) which we enjoyed out in the fresh air. After a bit of a wander along the beach and a read, it was time to pack up and head home. We enjoyed our short weekend in Wales, somewhere we always seem to return to.